Kara Hastings has risked her inheritance from her father to open Sugar & Spice, her own cookies-only bakery, but she is overwhelmed with all the work involved. The Christmas season makes her product in greater demand, particularly her special gingerbread houses. This is great for the bakery’s bottom line but not so good in other ways for the exhausted, sleep-deprived owner. The pressure to make a success of her business is intensified both by the emotional connection to her father and by the doubts of her mother and others who think the bakery is just the latest of Kara’s fleeting interests. Kara feels that she has a lot to prove, and her focus on Sugar & Spice doesn’t leave her much time for a personal life. Her happily married and about-to-be-married friends and her younger, newly engaged sister make Kara long to find “the one,” but Briar Creek doesn’t offer much opportunity to meet the man of her dreams. And then Nate Griffin shows up. Nate, a workaholic management consultant, is paying a duty visit to his aunt. He has a deep affection for his quirky, bossy aunt, but he is not enthusiastic about spending time in Briar Creek. Not only does it seem slow after his busy city life, but the town’s immersion in Christmas and all its trappings stirs painful memories of his childhood Christmases made bleak by poverty. Nate’s plan is to ease his guilt by spending time with his aunt who adores him and then to return to Boston ASAP. Despite his reservations, Nate is caught up in his aunt’s frenzy to decorate her bed and breakfast so spectacularly that she will win the town’s annual contest for the best decorated Christmas house. Her matchmaking plan proves even more difficult to elude. Nate and Kara have a disastrous first meeting when he inadvertently destroys a cookie order intended for the B & B, an encounter that leaves Kara angry and tearful. However, neither she nor Nate can stop thinking of the other. Even as attraction sparks between the two, Nate resists because he has jumped to the conclusion that Kara is a wealthy heiress for whom the bakery is a whim. Kara is offended by Nate’s attempts to give her business advice, and she knows his time in Briar Creek is short. But these are merely bumps on the road to a holiday embellished HEA. Olivia Miles comes full circle in this fifth book in her Briar Creek series, adding a second Christmas romance to the series that began with Mistletoe on Main Street. Fans of the series will remember Kara who played a prominent secondary part in Love Blooms on Main Street (Book 4). I found her to be a much more sympathetic character in her own book, less whiny and more vulnerable. Nate is a younger, hot version of Scrooge. Seeing him fall for Kara and for holiday-drenched Briar Creek should have great appeal for readers looking for a sweet Christmas romance. This book stands out among the 2016 Christmas romances I have read because the holiday is more than backdrop. From the food-coat-toy drive and the decorating contest, which is a major plot element, to Kara’s gingerbread houses and Nate’s need to learn to keep Christmas in his heart, this novel is saturated with the traditions and sentiment of Christmas. If you have enjoyed Miles’s other Briar Creek books, you should definitely read this one. I also recommend it to those who love a heartwarming Christmas romance. Christmas Comes to Main Street has Hallmark Holiday Movie written on it from the cover to the conclusion. 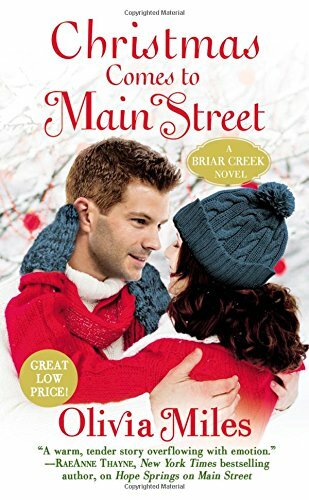 Christmas Comes to Main Street by Olivia Miles....I Loved, Loved, Loved this wonderful story, it has put me in the Christmas spirit. This book is such a sweet, fun and loveable read. I have loved reading all the books in this series. I can't wait to read this book!